Businesses make investment decisions based on any number of factors. Sometimes they invest to solve an immediate challenge, other times the investment is made to gain a competitive advantage in the face of changing market conditions. For medical practices, telemedicine represents an investment that fits into both categories. It helps increase revenue for work the practice is already doing today and it positions the organization to benefit from the quickly changing healthcare delivery landscape. Here are five reasons that smart practices are making the decision to start a telemedicine program. The most valuable asset in any practice is the provider’s time. Follow-up telephone calls may be a vital part of patient care, but they are generally not reimbursable, meaning that time does not contribute revenue to the practice. Telemedicine solves this problem by turning these conversations into reimbursable encounters in many cases. Providers can set aside the time to go over test results, review treatment efficacy, and discuss next steps. In addition to boosting the bottom line, the approach creates a closer connection to the patients and increases the likelihood that the information will be understood. Just this one change can often be enough to achieve a positive ROI for telemedicine. By 2030, elderly adults will comprise about 20% of the US population. Beyond that, demographic projections assume that every other person born since the beginning of the 21st century in the US and other countries including France, Japan, Germany, Italy, the UK, and Canada will live to 100 years. Older people frequently suffer from multiple health conditions, take more than one medication, and require more encounters with health care providers. As it grows, this group of healthcare consumers will exert more and more pressure on our already taxed healthcare system. Telemedicine technology will be a big part of solving this complex problem, allowing providers and patients to connect remotely for follow-up visits, medication management, and chronic illness care. Providers will be able to serve patients more efficiently, yet maintain an excellent standard of care. Elderly people aren’t the only ones coping with chronic illness. Unfortunately, the incidence of chronic conditions cuts across all demographics. It is estimated that by 2025, chronic diseases will affect approximately 164 million Americans – almost half of the population. Practices can take advantage of telemedicine technology to care for patients with chronic conditions in a number of ways. Medication management, a significant part of treatment for many of these patients, can be handled remotely, increasing efficiency for the provider and convenience for the patient. Lifestyle coaching, in the form of weight management, smoking cessation, and the like is often an important part of the treatment of chronic illness. Using video technology for these visits makes it more likely that the provider and patient can stay on top of the treatment plan and check-in as frequently as necessary. Given these factors putting more stress on the healthcare system, and the shortage of providers to meet the increased demand, it is no wonder that providers are feeling overwhelmed and unduly burdened. 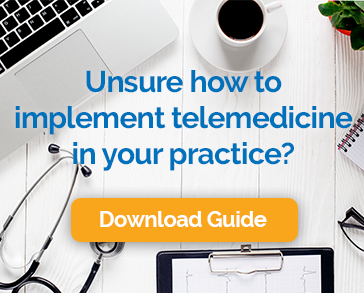 Telemedicine can offer relief by decreasing the amount of time it takes to see each patient and allowing for providers to conduct some encounters from home. It also opens the possibility of working flexible hours by scheduling some remote visits after traditional working hours or on weekends. This can be done without any additional office overhead or special equipment. Like it or not, the “retailization” of healthcare is happening quickly. Patients have more options than ever in terms of getting care, including retail walk-in clinics and online-only providers. Consumer demand for telehealth is strong and growing, with one study finding the 50 million Americans would change from a primary care provider that does not offer telemedicine to one that does. An investment in telemedicine technology can be seen as both a guard against completion and a customer satisfaction necessity. The healthcare landscape is changing drastically in terms of both demographics and customer demand. Telemedicine can be an important tool as practices try to evolve to embrace this new reality. Change is difficult, but in the case of telehealth, it may not be as challenging as you think. There are solutions that offer an easy-to-use, integrated scheduling platform, reimbursement verification, and HIPAA compliant audio and video. If you find one with expert support and a reimbursement guarantee, you’ll be well-positioned to serve the needs of patients while increasing flexibility and generating more revenue. Telemedicine offers a win-win for patients and practices.